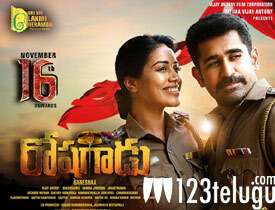 Vijay Antony, who is continuously dubbing his films in Telugu has come up with yet another film titled Roshagadu. Touted as an intense cop drama, the film has hit the screens today. Let’s check how it is. Like all Vijay Antony films, this film also struggles with the slow pace narration. Though the core point is decent and has enough scope for commercial elements, the director failed to deal with the proceedings in an interesting manner. After the first fifteen minutes, the audience comes to know that this film is going to be all about a fight between a cop and a deadly goon. The film has a lot of Tamil flavor which may not go well with our Telugu audience. Till interval, there is nothing much except for a few preaching scenes from the protagonist which also look jaded after a while.